U.S. author and poet Maya Angelou has died at age 86 in North Carolina, local media reported on Wednesday, citing her agent and a local official. Angelou provided eloquent commentary on race, gender and living life to its fullest in poems and memoirs such as “I Know Why the Caged Bird Sings” which brought her wide acclaim. She wrote more than 30 books and was a Grammy winner for three spoken – word albums. She had a home in Winston-Salem North Carolina, where she was a professor of American studies at Wake Forest University. She was honored at the National Book Awards ceremony last year for her service to the literary community. She was born on April 4, 1928 and has been called “America’s most visible black female autobiographer” by scholar Joanne M. Braxton. She is best known for her series of six autobiographical volumes, which focus on her childhood and early adult experiences. The first and most highly acclaimed, I Know Why the Caged Bird Sings (1969), tells of her first seventeen years. It brought her international recognition, and was nominated for a National Book Award. She has been awarded over 30 honorary degrees and was nominated for a Pulitzer Prize for her 1971 volume of poetry, Just Give Me a Cool Drink of Water ‘Fore I Diiie. 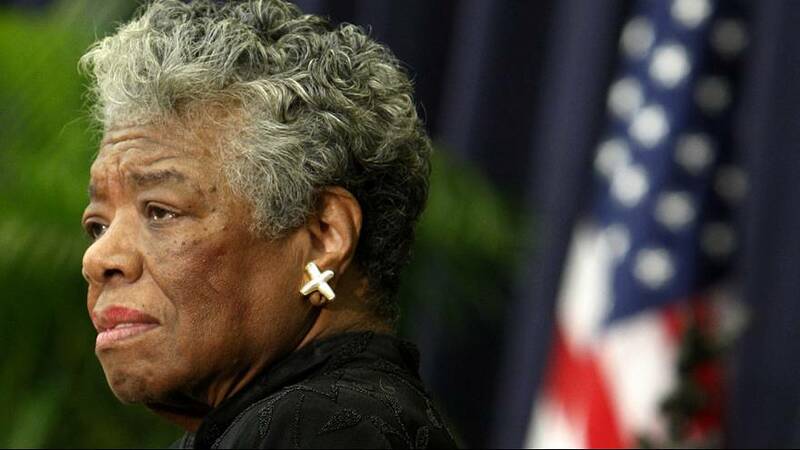 Angelou was a member of the Harlem Writers Guild in the late 1950s, was active in the Civil Rights movement, and served as Northern Coordinator of Dr. Martin Luther King, Jr.‘s Southern Christian Leadership Conference. Since 1991, she has taught at Wake Forest University in Winston-Salem, North Carolina where she holds the first lifetime Reynolds Professorship of American Studies. Since the 1990s she has made around eighty appearances a year on the lecture circuit. In 1993, Angelou recited her poem “On the Pulse of Morning” at President Bill Clinton’s inauguration, the first poet to make an inaugural recitation since Robert Frost at John F. Kennedy’s inauguration in 1961. In 1995, she was recognized for having the longest-running record (two years) on The New York Times Paperback Nonfiction Bestseller List. With the publication of I Know Why the Caged Bird Sings, Angelou was heralded as a new kind of memoirist, one of the first African American women who was able to publicly discuss her personal life. She is highly respected as a spokesperson for Black people and women. Angelou’s work is often characterized as autobiographical fiction. She has, however, made a deliberate attempt to challenge the common structure of the autobiography by critiquing, changing, and expanding the genre. Her books, centered on themes such as identity, family, and racism, are often used as set texts in schools and universities internationally. Some of her more controversial work has been challenged or banned in US schools and libraries.